Structural Adhesives Market size will cross USD 7 billion by 2024 with gains at over 4% between 2016 and 2024. Structural adhesives market will witness growth owing to its unique ability to offer exceptional bond strength and fast curing speed for dissimilar and similar substrates in the automobile industry. The product is formulated to lower the vehicle weight and improve the safety & performance. Product manufacturers make special performance products for automobile applications, used for interior and exterior applications of vehicles such as deck lid flanges, hoods, interior dashboards, doors, and roof panels. Increasing per capita income and improved living standards amongst youth in emerging economies has propelled the automobile market since the economic downturn. Increasing awareness about fuel economy and light weight vehicles will bolster the overall structural adhesives market. Another important driving factor for structural adhesives market is its extensive usage for bonding helicopter and aircraft’s components, and airframes. It provides high quality finish for crucial aircraft fabrication applications such as for engine components to curtail vibrations, edge, and core filling materials for reinforcement on structural components and primary substrates, and honeycomb sandwich panels bonding for rigid interior panels and to reduce weight. Increasing disposable income, global tourism trend, and reduced air fares due to competition among air liners has led to affordable air travelling that will drive the aerospace industry throughout the forecast spell. With the advent of modern warfare technologies, increasing military expenditure to build heavily equipped, highly maneuverable, and lethal fighter planes will also positively influence the global structural adhesives market in the near future. Based on number of components, structural adhesives market is categorized into single and double component products. Double component is mostly used for critical applications where the factor of safety is very crucial and bond failure may have harmful consequences. In this type, one component is the prime adhesive resin and the other is a hardener that catalyzes the bonding of this adhesive. This segment will hold sway the global market throughout the forecast spell with close to two thirds of the global share. Single component is used mostly in water & sewer, furniture, and leather industries. It is applied mostly between similar substrates and consumed in the fields where the adhesion is required for comparatively shorter time. They require either high temperature, substances, or surrounding media such as light and humidity to initiate curing. This segment generated more than USD 2 billion in 2015 for the overall structural adhesives market and will flourish at close to 4.5% CAGR. Polyurethane contributes substantially in structural adhesives market in term of volume. It is used in automotive and aviation industry as it cures fast and provide a high bonding strength. Polyurethane is an economical and efficient product for low impact and slightly flexible applications along with large bonding areas. It accounted for over half of the global structural adhesives market volume in 2015. Epoxy is another notable product type with more than a quarter share in terms of volume. It has the advantage of adhering a variety of materials, resists creep under load, prevents environment and chemical corrosion, and provides high strength. It tends to fail under shear, but provide superior temperature resistance. Acrylic structural adhesives market generated revenue over USD 1.5 billion in 2015 owing to its high bonding strength on plastics and metals. Low resistance to vibration and impact, however, limits the product usage from heavy duty applications. 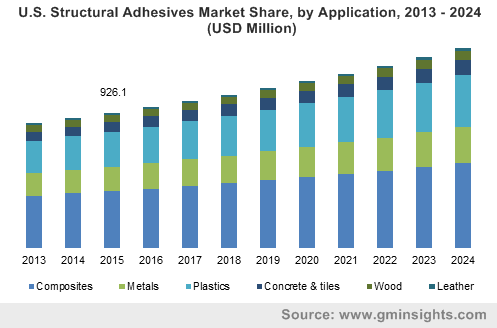 Structural adhesives market application segment includes composites, plastics, metals, wood, concrete & tiles, and leather. The product is widely recognized for its adhesion of dissimilar substrates, such as aluminum, plastics, fiber, glass, and wood, without mechanical joining procedures such as fasteners, which may create mechanical failures. Growing usage of composites in the automotive and aerospace industries in order to replace metal parts for weight reduction will boost this segment in coming years. Composite adhesives application accounted for more than a third of the global structural adhesives market in 2015 and will hold sway throughout the forecast spell. Manufacturing processes in today’s rapid industrialization scenario is highly dependent on plastic bonding. Almost every product consist plastic in one or another form and the product is heavily used to improve aesthetics and mechanical properties by replacing welds, rivets, nails, and screws in plastics. They bond plastics with contaminated and oily surfaces reliably. Structural adhesives market size for plastics was more than USD 1 billion in 2015 and will exhibit growth at close to 4.5% CAGR. Automobiles industry has a wide and multiple product application of due to the presence of several dissimilar components. Improving global economy and stabilizing China slowdown will likely foster the automobiles industry in coming years. Moreover, increased affordability of consumers due to wide range availability of vehicle segments, has attracted buyers. Flourishing automobile market registered more than USD 1 billion for the structural adhesives market. The product is used in aviation & aerospace industry for benefits such as automatable applications, high glass transition temperature, custom packaging, fast set systems, exceptional compressive strength, superior toughness and durability, high peel strength and resistance to cyclic fatigue. Asia Pacific has witnessed a robust growth in aviation industry in recent years and is world’s fastest growing region in air travel. An average growth of over 5% is expected in Asia Pacific air traffic in the next 20 years. This segment will flourish at more than 4% CAGR in the coming years. Asia Pacific will be a promising region in structural adhesives market in the forecast spell. India and China registered escalating construction spending through government initiatives and private investments. Many automobile giants are establishing their manufacturing base in emerging economies of Asia Pacific due to abundancy of cost effective labors. Highly mature shipbuilding industries in China, South Korea, and Japan will also drive the regional market. Asia Pacific registered more than USD 2 billion for the overall structural adhesives market in 2015 and will flourish at a healthy rate in the coming years. High constructional activities in the U.S., coupled with highly developed aviation industry will bolster the North America structural adhesives market. Moreover, the presence of several automotive giants such as Ford, Bombardier, and General Motors in the U.S. and Canada will also signify the product demand. North America accounted for over a fifth of the overall market up to 2024. Structural adhesives market is moderately fragmented with major players in Europe and North America. Manufacturers indulge in mergers and acquisitions to increase their footprint to serve multiple and diverse market. They also focus on continuously expanding their product portfolio in order to meet specific customer demands. For instance, L&L Products introduced A-K540, a structural adhesive that provides robust and fast curing adhesion for low surface energy plastics. Key manufacturers in structural adhesives market are 3M Company, Illinois Tool Works, Lord Corporation, Arkema, Scott Bader, SIKA AG, L&L Products, Dow Chemical Company, Ashland, Henkel AG, Master Bond, Panacol-Elosol, Elantas, Parson Adhesives, Hubei Huitian Adhesive Enterprise, and Permabond. Structural adhesives market comprises of specialized adhesives which are used for load bearing applications. They are gaining popularity as substitutes for mechanical joints such as rivets, bolts, screws, fixtures, and welding as they prevent mechanical failure caused by such joints and provide strong adhesion for similar as well as dissimilar substrates. The product is extensively used in various critical applications in different end-user industries due to their light weight. Continuous research & development to enhance the product portfolio in order to meet customer requirements characterizes the market. End-user companies rely on a long term and reliable supply chain on the basis of product quality and specific applications. Government regulations pertaining to critical product applications in aerospace and automotive industries provide a challenge for new industry participants.